Let Well Arranged Travel’s custom private tour of Tuscany take you on a three-day tour featuring Lucca, one of the most graceful, charming and elegant cities of Tuscany; and Viareggio, the biggest beach resort in Tuscany. You’ll also visit the historic city of Pisa and the stunning seaside villages of the Cinque Terre, located on the rugged Ligurian Coast. Let Well Arranged Travel’s private tour of Tuscany take you on a private three-day tour featuring Lucca, one of the most graceful, charming and elegant cities of Tuscany; Viareggio, a resort town famous for its beaches. You’ll also visit the historic city of Pisa and the stunning seaside villages of the Cinque Terre, located on the rugged Ligurian Coast. You will be taken to your hotel to check in and drop off your bags. On the way to Lucca, your driver-guide will share his knowledge of Lucca. Our guide will stroll with you to Lucca’s important sites, followed by free time to stroll around this charming city, walk the city walls, climb the Guinigi tower, and enjoy the shops at Via Fillungo. Sites not to be missed include the cathedral of San Frediano, where you can view the body of St. Zita in a glass coffin, and the site where once an Ampitheater, an elliptical Roman coliseum, once stood. Today your private tour guide will take to Viarregio, a city on the coast of the Tyrrhenian sea and the largest beach town in Tuscany. Its promenade is lined with Liberty style villas and buildings housing shops, restaurants and cafes. 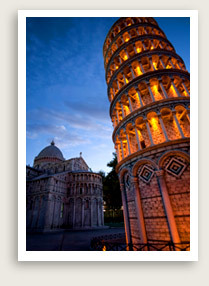 Next, you will have a guided tour of historic Pisa, a Roman colony from the 2nd century B.C. and a naval and commercial port. In the Middle Ages it became a maritime republic, rivaling Genova, Amalfi and Venice. Most of the city’s finest buildings date from the 12th and 13th century, by which time Pisa controlled Corsica, Sardinia, and most of the mainland coast. Since the 15th century the city was governed by Florence, whose Medici rulers re-established the University of Pisa, where Galileo, Pisa’s most famous native, once taught. Your guided tour of Pisa will take you to the so-called “Campo dei Miracoli”, a large grassy piazza containing Pisa’s cathedral, the baptistery, the cemetery and finally the very famous leaning tower of Pisa. You will have free time to wander around this beautiful square and enjoy the amazing architecture of the buildings before returning to Lucca for the night. A Cinque Terre tour from Florence is always a great idea but it is wonderful when done while you are located much closer to the area. It is one of the most beautiful coastlines of Italy. The charming villages of the Cinque Terre (Italian for Five Lands) stretching along Liguria’s rocky coast are unforgettable: olive groves, vineyards, winding stone paths and enchanting small beaches wedged between cliffs, fishing villages and colorful rooftops. An excellent tour guide will lead your Cinque Terre tour starting in the largest of the five villages, Monterosso. This lush green village is sheltered by hills covered with vineyards and olive groves. Your Cinque Terre tour will continue with a very short train ride to the village of Manarola. Your stop in Manarola may include a walk along a footpath called La Via dell’Amore (the Lovers’ Pathway), which ends up in Riomaggiore, the last of the five villages. After this leisurely half-hour walk, you will have some free time for shopping and strolling around the last town before the journey back to Florence.